Graduation! 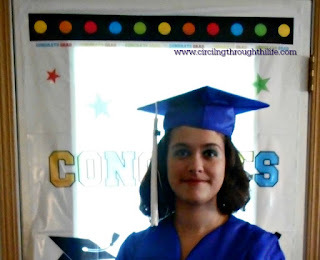 We have our second home school graduate! It seems such a short time ago I was freaking out because she taught herself to read and was asking me all kinds of embarrassing questions about the headlines on magazines in the check out lane. Boy I was grateful for the family friendly check out lane but I do wish it didn't have to replace magazines with candy. Unlike her older sister, Turtlegirl, didn't want a big huge celebration. She's a quiet introvert. Our church has a tradition of honoring graduates. It was the perfect way to acknowledge Turtlegirl's achievement without forcing her to be in the spotlight alone. After liturgy, Father called the graduates forward. He prayed for them, spoke a short mini-sermon and gave them each prayer book. It was beautiful. I have no idea what happened the day church honored graduates with BooBear as that is the infamous heart attack day. The parish house was decorated and there was cake! 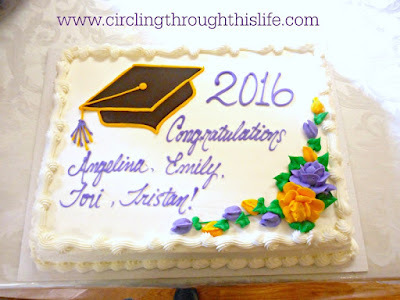 It was very sweet to see four graduates! 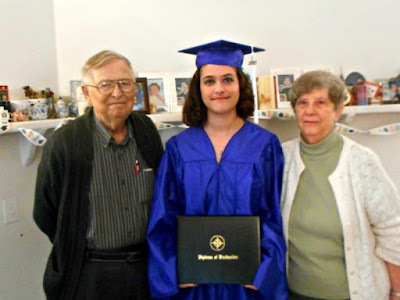 No they were not all home school graduates but that made it more beautiful. With permission from Honeybear and Turtlegirl I am going to share the little speech. It warmed my heart. I will ask up front for a little understanding, as I don't get to do this very often. In fact, this is only the second time I've done this. Graduating from high school is one of the first major milestones people hit. There are birthdays of course, but those become less of milestones and more of uncomfortable reminders. Certainly wouldn't want to do without them but still . . . Anyway, we're here because we are celebrating this milestone with [Turtlegirl]. She wasn't the first, so the amount of experimenting we had to do was a little bit less, but only a little because in education one of the the biggest difficulties is keeping students challenged. I know in my own education that was often an issue. If I wasn't challenged, then I didn't give it the appropriate level of attention. But that that's a story for another time. Trying to find the right level of challenge for [Turtlegirl] was probably the biggest concern we had. Whether it was reading (holds up very thick book) three hours for this one, math or even science trying to challenge her was, well, a challenge. Now, you've hit the finish line, and you've acheived something you can be proud of. It is definitely a milestone for you. Since it's your first milestone, right now it's pretty big. You're moving into a higher level of education and bigger challenges. And as you reach those other challenges, you'll hit other milestones, but hopefully, you'll look back on this one with warmth and pride. Congratulations! My heart swells with joy and love as I see how she has grown. My heart aches when I think of her leaving for college but if she studies and works as hard at college as she has to finish her high school requirements she'll be fine. She has a hunger and a thirst for knowledge and a desire to learn. Improve your speech, concentration, and even your singing with Forbrain! When I found out that the Crew would be reviewing a bone conduction headset from Forbrain - Sound For Life Ltd I was more than just a little curious. Having worked with a neurodevelopmentalist and speech therapists with Supergirl, I am familiar with the importance of audio memory to brain organization and optimal function. Forbrain - Sound For Life Ltd states that this device can improve memory, attention, and speech. The more I looked over the website the more convinced I was that Tailorbear and Turtlegirl would benefit just as much as Supergirl. Forbrain is a device that maximizes the natural audio-vocal loop that every person uses to analyze, assimilate, perceive and adjust information received and produced through sound. For details on this loop and how Forbrain works check out these links: The Auditory Process, and Forbrain's Audio Technology. Tailorbear was my primary focus during the review period. She wears the device for approximately 20 minutes a day. We aim for 5 days a week. Sometimes she stands. Sometimes she sits. Sometimes she walks around. Most of the time she reads aloud from her novel for her literature study. Sometimes I hear her singing. 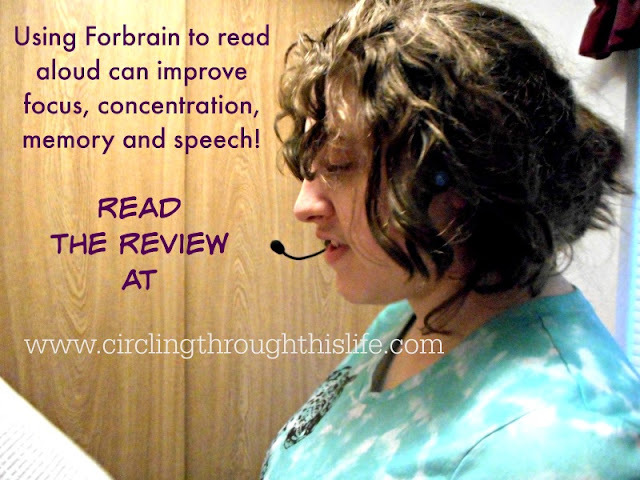 She shared with me that when she uses Forbrain she is better able to focus and concentrate. Turtlegirl and I both noticed that Tailorbear's singing has improved. Though she has a lovely singing voice she doesn't always stay in the right key. Now she is much more likely to stay on key. She stopped using Forbrain for a week and I noticed that she did not get as much school done. She was more prone to be distracted and failed to stay on task. I am making Forbrain a requirement for every school day for her because it helps her. Even after the first time I used Forbrain, I noticed an increase in my ability to focus. It was a little weird how after I took off the headphones, everything sounded different, but I'm not sure what that means. I have noticed a positive difference after using Forbrain. I am more aware of the way my voice sounds when I talk. (Example: I can hear that I'm kinda monotone and don't emote well with my voice.) And when I hum, I can actually hear when I go off tune. I'm no longer as tone deaf as I used to be. I recently started using it with Supergirl. Since she cannot do it independently the way her sisters can, I needed to make sure I committed to working with her. Supergirl has DiGeorge Syndrome. She also has brain injury from in utero strokes. DiGeorge affects many different areas including speech. I knew that I wanted to use to Forbrain with Supergirl because she is a "poster child" of sorts for the type of therapy this device can provide. She is developmentally much younger than her chronological age so I have her working for 10 minutes a day rather than the 20 that a typical 18 year old would do. Currently we are using Forbrain while we do our Poetry Memorization. She recites the poems she has memorized already and then we work together on memorizing the current poem. I will say a line and she repeats it. 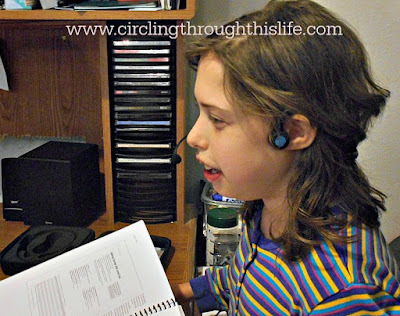 I will often repeat words that I knew she struggles with so that she can practice them with the device. Certain sounds are nearly impossible for her but my hope is that by using Forbrain her speech will be come more clear. I plan to begin using Forbrain with her during her phonics lessons with Logic of English. We will be working with phonemes and phonograms and I think she'll be able to improve her speech patterns while improving her reading fluency. Forbrain is an asset that I think every speech pathologist and speech therapist should have access to. I see this tool as being a way to continue to work on brain/neurological development and improvement with Samantha. 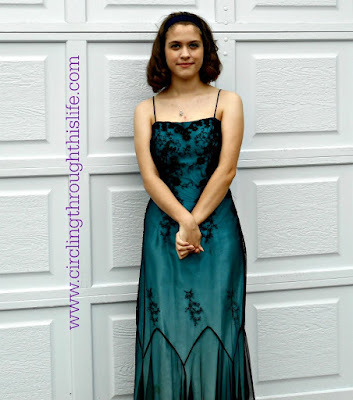 I also see this helping Tailorbear to improve her focus and concentration which will help her with studying for her senior year and preparing for post high school education. I am very impressed with this device and the improvement I see in my daughters. Click on the banner below to read what other members of the Crew had to say about Forbrain! 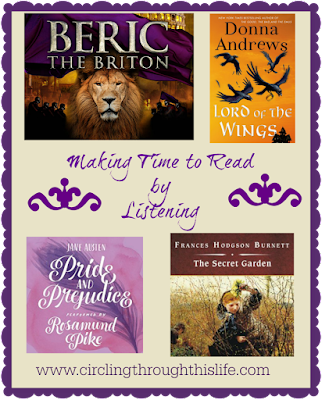 Making Time for Reading by Listening! How did it get to be June already? And nearly half way through at that! I have lots of things I want to write about but today I want to talk about reading. About what I've been reading actually. At some point I want to talk about reading aloud and how important it is and how reading aloud to older children and teens is just as important as reading aloud to your toddler, preschooler, and early elementary kids. I suspect that reading aloud to other adults and being read aloud to as an adult has benefits as well. 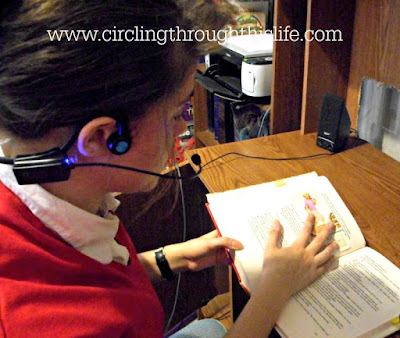 Benefits beyond being able to use an audiobook to multi-task. Pride and Prejudice by Jane Austen ~ Yes, I have read this book before and yes I have seen the Colin Firth version of the movie (mini-series!) multiple times as well as a few other versions. Supergirl is very familiar with the story because she loves the mini-series. We're listening to it together. Well she started listening to it and I was reading it but we've switched to listening to it. The Secret Garden by Frances Hodgson Burnett ~I have never read this book but I know it is a classic. Supergirl and I started listening to this one together. Lord of the Wings by Donna Andrews ~ I started out reading the Kindle version of this Meg Langslow mystery but my loan ran out before I was finished with the book. I was able to pick it up as an audio book for just $4.99 so I did. I am thisclose to finishing it. Beric the Briton ~ G.A, Henty ~ well actually we listened to an Heirloom Audio Production which is like an audio drama and is an adaptation of the book. The crew will be reviewing this later this summer. We finished this one in three sittings! We plan on listening to it together again. I enjoyed this one more than I thought I would. I do still have several "real" books in my currently reading pile but I'll talk about those some other time. I want to mention that I am reading the third book in the Atlantis series. If you like science fiction combined with action and adventure then you will enjoy this series but make sure you clear your calendar as these books are next to impossible to put down once you've started reading!